In March 2015, the Star Tribune completed the relocation of its headquarters from a building that had been its home for 95 years to three floors in the newly renamed Star Tribune building in downtown Minneapolis. The Star Tribune is Minnesota’s largest news organization with over 250 journalists who staff the the newsroom around the clock. Given the opportunity to look towards the future, the Star Tribune partnered with HGA Architects to create new offices that incorporate the needs of a 21st century news organization. Because the news organization hosts important visitors from all walks of politics, business and community, an essential component to the new design was a lobby and a News Hub that welcomes, impresses and informs visitors and employees. 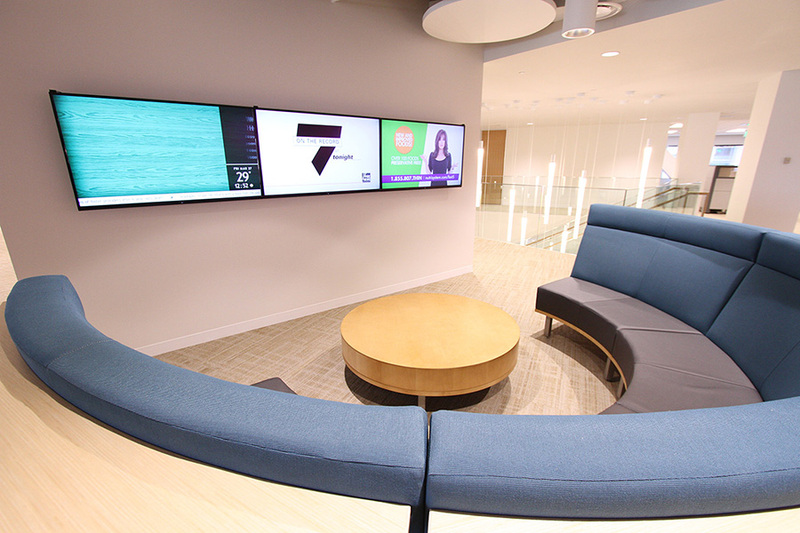 The lobby includes a 1x3 LED video wall and digital signage to provide news and information. The News Hub contains a 1x4 LED video wall and an eye-catching central column with eleven LED screens to provide easy viewing of breaking news in all directions. To provide content for these screens, the Star Tribune and HGA turned to systems integrator Alpha Video in Eden Prairie, MN who recommend the installation of TriplePlay HD IPTV distribution system and CastNET Digital Signage Content Management Software.The TriplePlay server is encoding 62 cable TV channels which are supplied by a Comcast Cable TV headend. The Cable TV content is distributed via the company’s network infrastructure to the screens on the News Hub column. The CastNET software manages content for the two video walls and the digital signs installed throughout the three floors and in the newspaper printing plant located in a separate location. CastNET feeds into the TriplePlay server so the digital signage content can be selected for viewing on any of the screens on the central column and on desktop computers and mobile devices. When the digital signage was designed, the main objectives were to have a place to showcase news and photography and to provide information to employees. The digital signs include a main zone of information and an L-bar zone that provides the Star Tribunes RSS news feed along with weather reports. The news feed scrolls continuingly along the bottom of the digital signs. 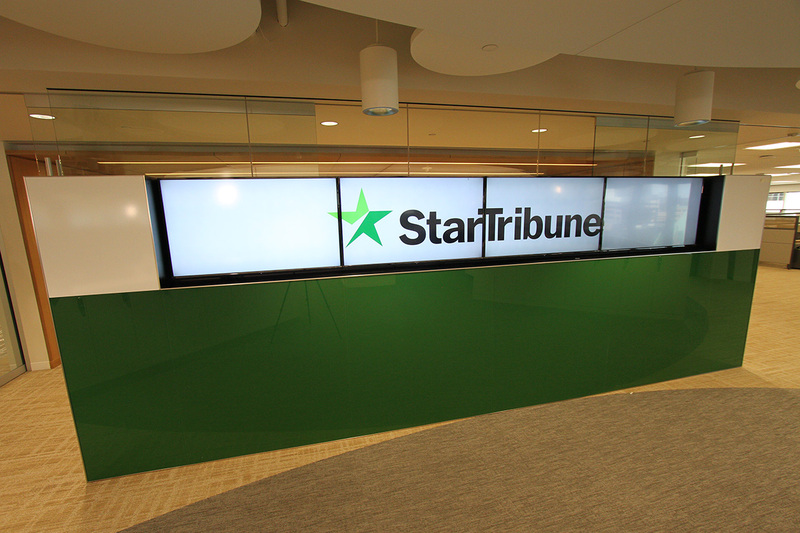 Since the installation, the Star Tribune has found that the digital signs are a very effective way to welcome and recognize guests, visitors and advertisers who visit headquarters. 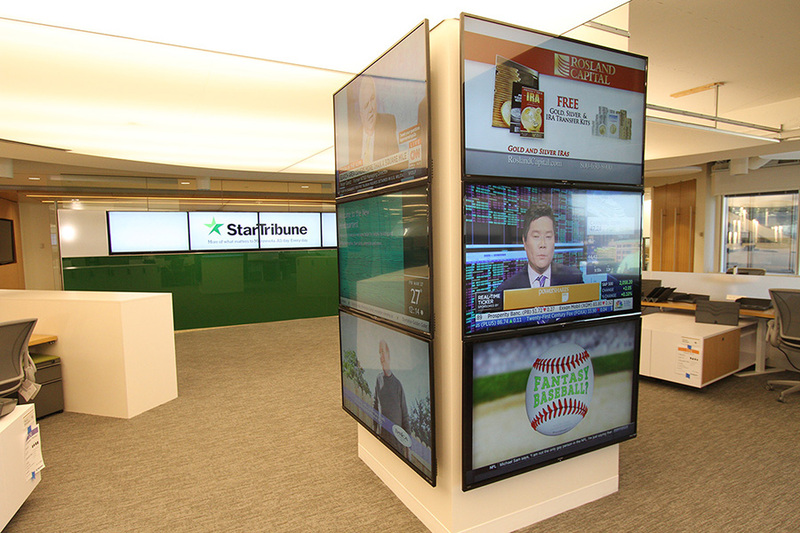 The Star Tribune consulted with the CastNET creative team to design specific templates for the 1x3 and 1x4 video walls. 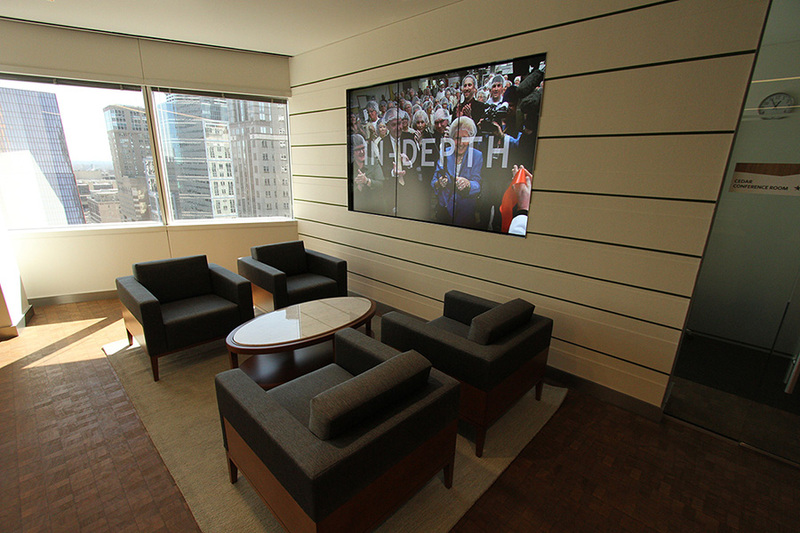 The 1x3 video wall shows pictures taken by the company’s photo-journalists. The template for this video wall allows a few words to be easily super-imposed over the pictures to highlight them. The 1x4 video wall is often used as the background when a news video is being produced by the news department. All of this technology helps to establish the Star Tribune as a news organization that’s ready for the 21st century.